As flat screens go, it really is brilliant. It seems almost completely insensitive to viewing angle, although when you tilt it up and down you can see the gamma changing very slightly. This screen is factory calibrated so it gives you pretty much correct sRGB (gamma 2.2) colours right out of the box. As I mentioned in a previous post, it is also able to actually show 8/24 bits of colour. So it doesn’t show any banding in a test such as this one. When gaming it is brilliant to have a large wide screen. Crysis never looked so good. With our XFX Radeon 4890 Black Edition I’m able to play with maximum settings @ 1920×1080. The first time I tried it it really made me go wow . The NEC pivots, but I noticed that my pivoting software interferes with Crysis for some reason, so I un-installed it. And after having Googled around for a while, I now realize that it is possible to rotate the screen by hitting Ctrl+Alt+arrow. Edit: I’ve found that to be incorrect. However, I’ve been able to set a keyboard shortcut in the ATI Catalyst Control Center. It also turns very easily around its foot. The turning mechanism on our old screen was so stiff that you always ended up moving the stand as well as the actual screen. Here are some photos comparing it to our old screen, an Acer AL1722. The most obvious difference is the colour temperature of the screens. I did each comparison straight on and with the screens at ~45 degree angles. Nothing much to complain about with a normal picture. Here you can see that the NEC is affected a lot less when viewed from an angle. For these shots the exposure was increased to exaggerate the effect slightly. But this is still pretty close to what it looks like in a pitch dark room. These two photos show that the colour temperature is very consistent across the screen. First I thought I could see a slight gradient from left to right, but when I analyzed them in Photoshop I realized I was just imagining it. Edit: Added a few comments about the comparisons. The screen comes with a nice cover that snaps into place on the back of the foot to keep the cables in place. The snap is a bit weak though so I have stuck ours in place with some blue-tak. The screen came with automatic brightness adjustment enabled by default. I found this to be rather annoying, since the effect was very noticeable when switching the desk light on or off. It would perhaps have been less annoying if the brightness was adjusted in a smoother fashion. As it is now, the brightness jumps up or down in a series of small yet very noticeable increments. Instead I usually have the brightness constant at around 40–50%. It is interesting how quickly you get used to the extreme width of the screen. I thought it would take much longer. Already I feel that going back to 1280×1024 would be pretty tough. I’m beginning to see the possible benefits of Windows 7’s improved window handling (without actually having tried Windows 7 yet). It would be very nice to be able to easily get two windows side by side. I know it is possible in XP too, but it is quite a tiresome process: Minimize all other windows, then choose the menu option after right-clicking the Task Bar. I’ll end with a summary: Highly recommended! I don’t know why. I can’t explain it. 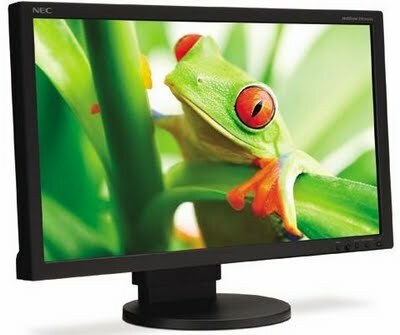 But for some reason I’ve started dreaming of a nice new wide-screen display for our computer. It is the NEC EA231WMi. It is 23 inches across. It shows 1920×1080 pixels. It can be raised or lowered, turned, or pivoted for reading long documents. But most importantly, the panel in this screen is an IPS panel. That means the picture is much more like what you got on an old fat-screen. Most flat-screens can’t actually show all the 16.7 million colours that an old fat-screen can. The fact that nearly all flat-screens only have 6 bit colour depth for red, green and blue is a well-kept secret. Now it couldn’t have been a well-kept secret if 6-bits meant horrible colour. It doesn’t. But it can mean that you get slight banding in gradients which should really be perfectly smooth. Have a look at the background on my website to see what I mean. The NEC EA231WMi can show all those colours. And it is much less sensitive to viewing angle than most other screens. Those things are great for a photo-geek like myself. Especially the bit about viewing angles, since it means that I don’t risk making photos too light or too dark because I happened to have the screen tilted slightly wrong when I made the adjustments. The fact that the screen is really wide is nice for using Lightroom, which has panels down both sides and the photo in the middle. On a wide-screen the photo area becomes much larger. The best thing is the price of this thing. Around $380, or SEK 3600, which is about half as much as most comparable screens. Still, I’ll have to ask for contributions for Xmas. The money I’ve saved up for unnecessary fun stuff isn’t quite enough yet.